San Luis Mountain looms above two-story buildings of old Downtown, but will be obliterated by new five story buildings being permitted by city. “Amenity transfer” is an awkward term you’re probably not familiar with, but there’s an old saying in politics: if you’re not at the table, you’re on the menu. If you don’t know about amenity transfer and live in San Luis Obispo, you’re definitely on the menu. Amenity transfer is about things we like about our city that are going away. It’s a way to explain where those things have gone, after they’re gone. We call public things we value, that give us pleasure or provide utility, civic amenities. They’re nice things, like free-flowing traffic, or views of our morros and mountains. Let’s talk about views. San Luis Obispo’s special beauty stems from the spectacular views of the morros and mountains that ring the city. We can see them from all parts of town. This is what makes San Luis Obispo different from Santa Maria, Fresno, Topeka, or anyplace else on earth. They make our city unique. And, we, the residents, understand and love that. Yet our views are disappearing at an alarming rate behind new bulky, often tall, buildings. One of downtown’s finest vistas of San Luis Mountain, on Marsh at Nipomo, will be blotted out by a bulky four-story project by PB Companies. This view disappearance downtown has been deliberately planned, thanks to our developer-friendly city manager and city council. The new crop of view blocking buildings would not have been allowed in the past. The city had strict height limits that until recently protected downtown views. Then, after years of badgering and campaign contributions from real estate developers, the city council raised height limits to please those developers, and to top things off, has allowed exceptions to the limits. Still, even before the first wave of tall view-blocking buildings gets completed, the very developers who stand to profit from view destruction were given special access to updating the general plan last year and pushed for even higher buildings over more of town. Enter “amenity transfer.” You may think your favorite view that’s disappeared behind one of downtown’s new edifices has gone away, been lost to development. Silly unsophisticated you, say city hall promoters of amenity transfer. Just because you can’t see it doesn’t mean the view’s gone. The public’s view, the amenity, has been transferred to others, from the many to the few. Our view now belongs to those who can afford million dollar condos or pay exorbitant top floor rent or pricey hotel charges in the latest downtown monstrosity. I first encountered city hall types genuflecting to amenity transfer during initial hearings on the soon-to-be-built Garden Street Terraces, a project that has progressed through its iterations from ridiculous to absurd. At the project’s earliest phases, residents were upset its five story mass would block cherished street-level public views as well as sunlight from streets and sidewalks. Views, said these people, would be destroyed, taken from us. Garden Street’s economist-for-hire enlightened us: public views weren’t being destroyed. The view amenity was simply being transferred from street level to the windows and balconies of tourists who’d pay hugely for a night in the pricey boutique hotel to be erected on a city parking lot. Rich tourists would thus acquire, for cash payment, our former views (and also our public parking spaces), which in the world before amenity transfer we had thought were a community asset. By the alchemy of amenity transfer the developer’s project also became much more valuable. They believe this stuff at city hall, and think it good, since as far as city hall’s concerned there just can’t be too many rich tourists paying dearly to benefit from amenity transfer of our cherished views. While those on the menu may feel differently, city hall’s long since ceased caring what we think. They rub their disdain in our faces. Don’t believe me? Just go to a council meeting, like a recent one where the council approved an 1,100 seat downtown bar somewhat disguised as a family-friendly bowling alley. Council members couldn’t heap too much rudeness, contempt and nastiness on brave residents who dared question whether a new 1,100 seat bar was what bar-filled downtown really needs. In a reprise, when the same brave residents returned to ask the council to seriously consider dealing with alcohol-fueled downtown violent crime, three council members roughly scolded them for presenting falsely alarming crime statistics, which, by the way, were from the FBI which surely knows less about crime statistics than council members coached by the city manager. The city, it seems, has become so cocky it no longer pretends interest in sentiments of residents, nor concern for inconvenient facts. This cockiness is nowhere better illustrated than in the city’s treatment of public views of morros and mountains. The city sees no problem that views, which give us pleasure as we go about our daily lives, which define the essence of our place on earth, are being sold off, privatized, or just plain given away. Not so long ago, city leaders were ashamed of making views go away, and when on occasion they caused one to vanish, they shamefacedly offered ironic or hokey gestures of apology, like the mural at the Morro-Pacific corner of the Marsh Street parking garage depicting an artist’s version of the obliterated view. But no more. Now they offer the rationalization of amenity transfer, without apology, let alone shamefaced ironic gesture. On Marsh between Santa Rosa and Toro, the public has always enjoyed stunning views of San Luis Mountain (pictured) and Bishop’s Peak, but these views will disappear behind expensive new three-story row houses. • On Marsh Street between Santa Rosa and Toro, there’s a dynamite iconic view of both San Luis Mountain and Bishop’s Peak that the public has enjoyed forever. Work has begun on a solid row of three story attached astonishingly expensive row houses for the very rich. If you’ve got $2 million, one of these can be yours, along with a fabulous view from your rooftop spa, said view formerly enjoyed by us peons but now privatized and packaged just for you. If this plays out like condos the same developer recently built at Marsh and Nipomo, many will be purchased by rich people from out of town who may not live here full time. • At the other end of Marsh Street, down by Nipomo, a four story monster by PB Companies will rise on the Foster’s Freeze site. It will obliterate one of the most stunning in-town vistas of San Luis Mountain. To drive home amenity transfer’s iron fist treatment of public views, the project’s architectural renderings show an ugly penthouse at the building’s top, perched there to grab our public view for itself. • Between these two Marsh Street view thefts is a third, Garden Street Terraces, where a five story boutique hotel will blot out another wonderful Marsh Street view of San Luis Mountain. • Over on the creek walk, behind the Higuera Street shops, near Nipomo, the overstuffed four-story mass of Monterey Place, which includes another pricey tourist stopover, will block blue sky and views towards San Luis Mountain, and will appropriate for itself the intimate creekside park’s amenity. The park will be diminished, de-naturalized, overpowered and privatized by terraced overlooks and balconies stacked above it. This in a neighborhood hitherto occupied by historic homes that crowd neither creek nor public creek walk. • On Monterey Street, just up from Chorro, a half block from the Mission, you can watch the Copelands’ so-called Chinatown swallow public views. 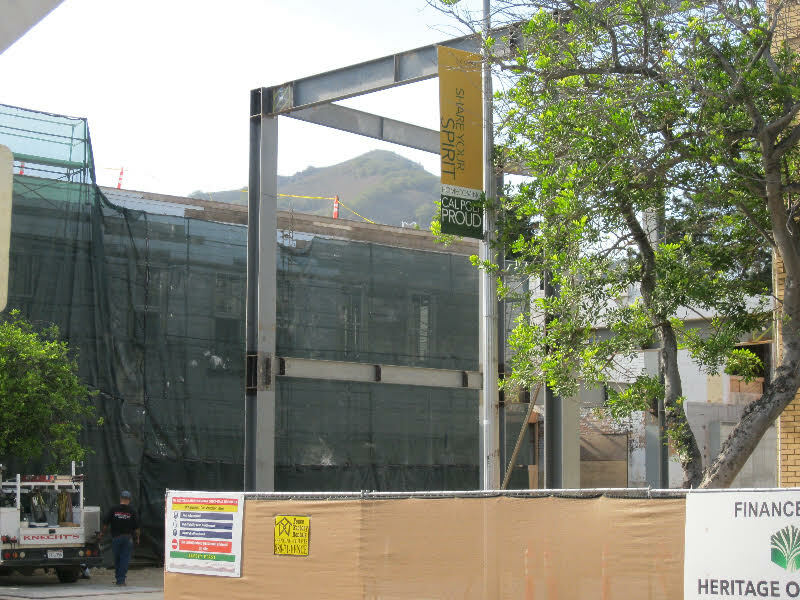 One view of San Luis Mountain has already disappeared behind a masonry shear wall, and another is framed by steel columns and beams, ready to disappear. • The Copelands’ damage on Monterey is soon to be repeated on Palm, where Chinatown’s uphill end will include yet another pricey boutique hotel blocking cherished public panoramas both of the Santa Lucias and of downtown with Terrace Hill and the Edna Valley in the distance. • This Palm Street damage ampifies what the city started several years back with its dysfunctional parking garage at Palm and Morro, for which the city granted itself a major height exception so it too could block a stunning view of the Santa Lucias, which the more sensitive design of the City-County Library next door had respected despite its three stories and tower. 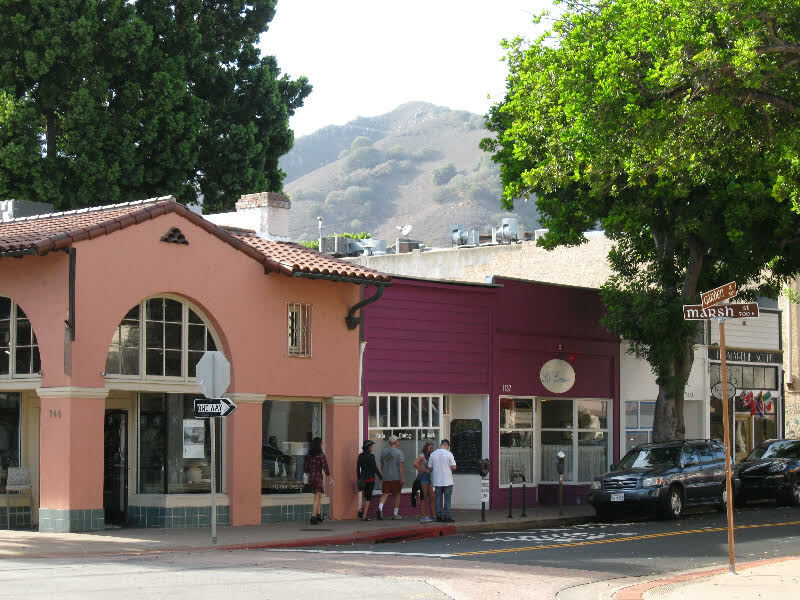 • Just down Morro from there, at the corner of Monterey, a very tall three-story monster will wrap around an existing two-story building, filling in the space from the city parking garage down to Monterey, and blocking Santa Lucia and morro views from several streets. 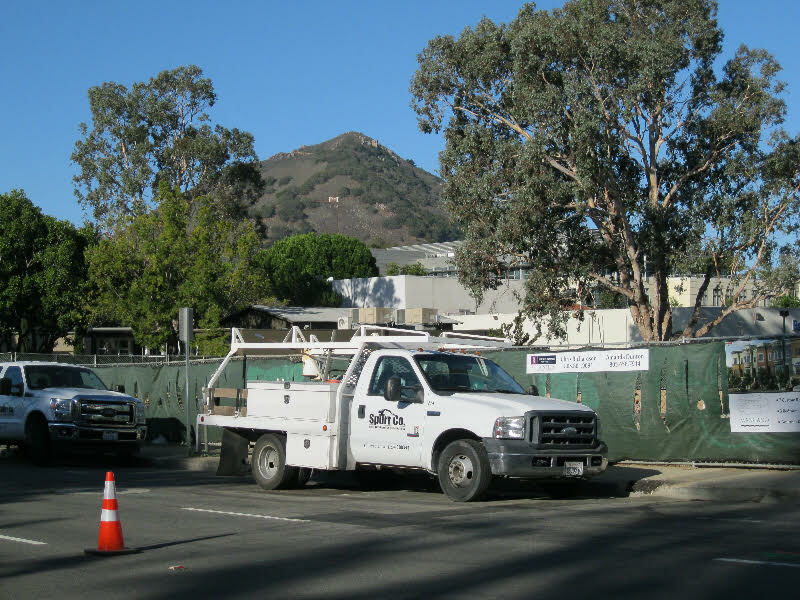 • Along a whole block of Santa Rosa, between Monterey and Higuera, work has begun on a bulky building which will block another wonderful downtown vista of the Santa Lucias. • Around the corner from there, on both Higuera and Monterey, Fremont Square is set to envelop the historic Fremont Theater with a five story monster with fancy abodes on top. 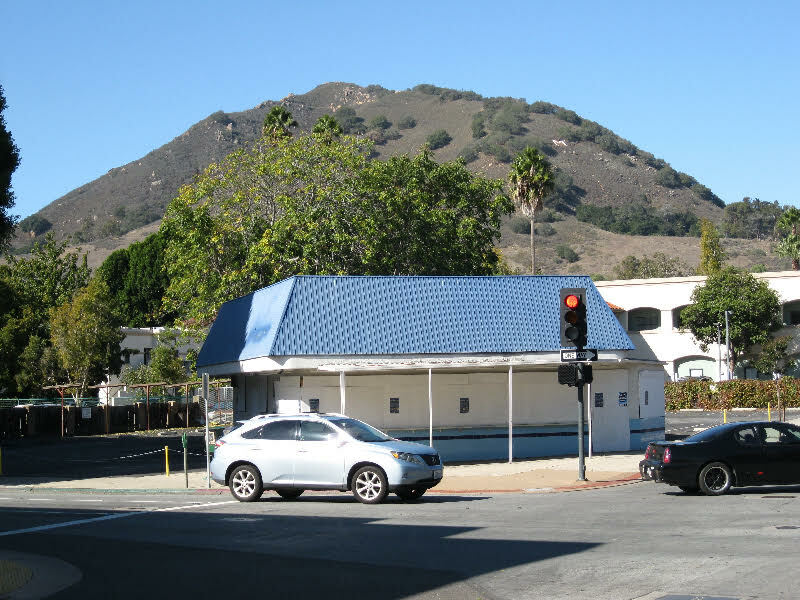 • On the Miners hardware parking lot on Santa Barbara Street, which affords nice drive-by street views of Terrace Hill and the Santa Lucia foothills, public views will disappear behind a half-block-long 3-story apartment/commercial building. • Going out the South Broad corridor, numerous tall apartment complexes will blot that outstanding view shed. Going, going Monterey view. Steel framework encloses the disappearing view of San Luis Mountain. So why are our cherished views disappearing? Does the city really not care? On paper, they care. The general plan commits the city to preserve views from streets and highways. But that provision was removed from the Circulation Element, a major element planners look at regularly, and stuck into an obscure corner of the general plan’s closet, the Conservation and Open Space Element (COSE), which nobody bothers to consult, even when they should. I recently observed an appeal hearing where the entire issue at hand concerned staff’s failure to implement a COSE policy, and for that hearing planning staff presented a lengthy written report that never mentioned the COSE, but repeatedly referenced land development components of the general plan. We have a city council that puts up with and supports this sort of staff misbehavior and subversion of democratically-adopted policies designed to protect public amenities. The city, with Chamber of Commerce support, advanced plans for an outrageously huge city-owned highway sign at Highland Drive and Highway 1. Despite intelligent objections from many residents, the city council approved this gigantic view-destroying city entrance sign the size of a two-story house. They just couldn’t wrap their minds around the fact this was a bad idea, a dumb design, an oversized ugly view-blocking confection – the exact opposite of what that beautiful location’s vistas deserve, that there might be better, more tasteful ways to denote the entry to our city, or that the building-sized sign represented total hypocrisy from a council that goes after other people’s much smaller billboards with a vengeance. So cocky city pushed ahead. It took the county planning commission to put its foot down, and force the city to redesign the awful thing. So, dear readers, as far as our city’s concerned we can kiss our views goodbye. Richard Schmidt spent eight years on the SLO planning commission back in days when development was tempered by city concern for impacts on public views and other amenities residents value, before the city itself became so alienated from the governed it would approve anything certain developers want. I’m going to miss that foster freeze. Are we getting a high speed rail station there? And? So? As if that were the key amenity. Nowhere does this opinion measure the value of a viewshed downtown against the value of the ability of those who work in SLO to be able to buy homes in SLO, or the value of our ag land, greenbelt and open space. Downtown is downtown. It’s urban. Let it be urban. Make it walkable and amenable to public transportation. The taller and denser you go there, the less spread out development needs to be elsewhere, preserving our ag land and open space. Let’s preserve THAT. Let’s reduce the need for commuter traffic into SLO. Stop forcing the 5 Cities and North County to be the bedroom communities for SLO, turning them more suburban than they need be. Cities are not static; they grow or they decline. So many words….so little wisdom.